I got from my library the first volume of, "Attack on Titan," and having read it I think I can conclude that most manga just isn't for me if lacks the words, "Akira," or, "Shin-chan," in the title. It is a perfectly acceptable and quick read--at least once I get past my initial adjustment period of reading a page right-to-left, has solid artwork, and the sci-fi concept of a massive walled-in city trying to keep huge humanoid monsters out is moderately intriguing. That said, I just wasn't too interested while reading this first volume and upon completing it did not feel as if I needed to rush-out and get the 2nd entry from my library (which, much props to it, has like the first 10 of the series readily available). I've been told that once the story really gets going and you notice allegories to the present-day in it the book becomes an even better read, but as it stands I'm not too interested in trying to read more. 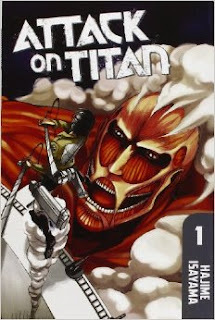 I generally enjoy anime, so perhaps any versions of, "Attack on Titan," in that vein will impress me more. As it stands though, the manga did not especially capture my attention, imagination, or excitement.